Finished at the Man, we head along the 180° ray - more or less - toward David Best's Temple of Joy. Here you see Ranger Betty Bud and Ranger Lefty out on patrol. The Temple is on the horizon. 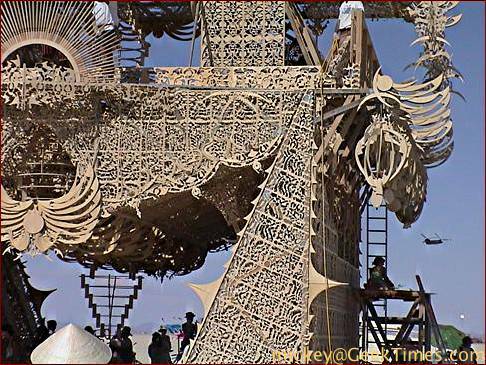 Well, now you can see the shape and structure of the Temple of Joy. Looks like something Balinese to me; I don't see much of the Japanese influence others have claimed (other than the generic oriental pagoda influence). 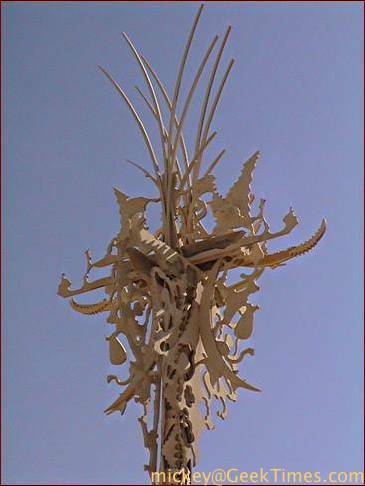 It's designed by artist David Best, from Petaluma, who did last year's Mausoleum, it was made of plywood throw-aways from a toy factory which makes dinosaur skeleton kits. 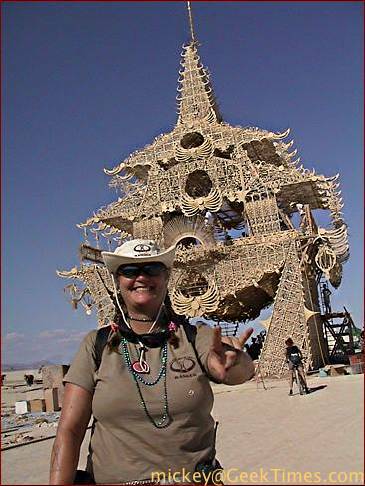 Á propos nothing at all, that spire rises 78 feet above the playa floor. Here's a close-up, but it doesn't really do justice to the incredible three-dimensional effect achieved from the many layers of playwood used. It was visually stunning. Here's Ranger Betty Bud showing her enthusiasm. Pretty amazing, given that we did six hours in the baking daytime heat. It was a grueling shift. 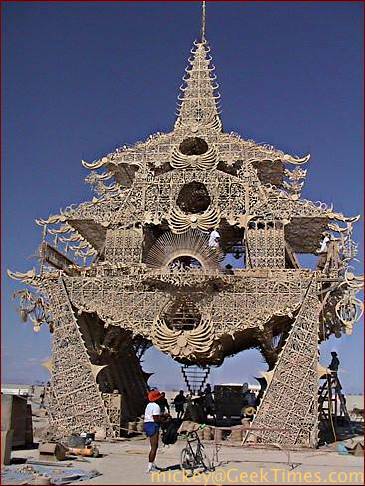 Here's a close-up of the main portion of the Temple of Joy. The volunteers are still working on it, and will for another two or three days. In the background you can see a Boeing CH-47 Chinook helicopter. I think it was National Guard, the same jokers who buzzed the city repeatedly during 2000 with that formation of three Lockheed Martin C-130 Hercules airplanes. 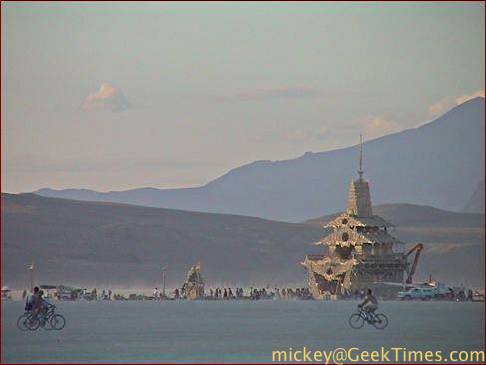 Others don't like the Air National Guard overflying Black Rock City, but it's certainly part of my Burning Man. And what a rush it must be for their crews! Today the visibility is incredible. 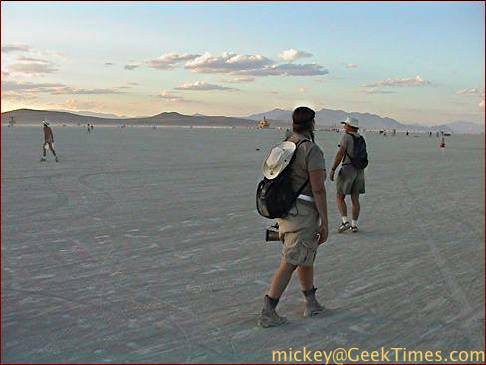 Compare it to Friday afternoon, when we were hit by our only dust storm of the event.